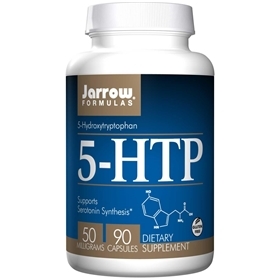 Jarrow FORMULAS 5-HTP (5-Hydroxytryptophan)is an extract of Griffonia simplicifolia seeds from coastal West Africa. Purity is assured by HPLC. 5-HTP is the direct metabolic precursor of serotonin and is important for the production of melatonin. NOTE: If you have a medical condition, are pregnant, lactating, or trying to conceive, are under the age of 18, or are taking medications (especially SSRIs, MAOs, or sedatives), consult your health care practitioner before using this product.